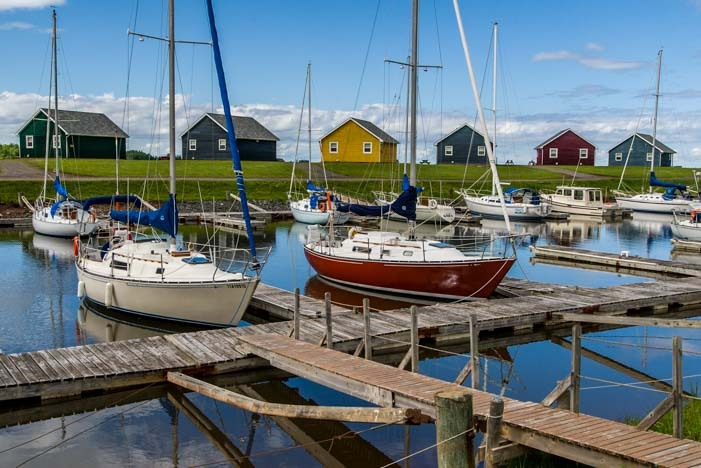 July 2015 – Nova Scotia is a big province and many of the most popular places to visit are spread far apart. The South Shore had delighted us with three beautiful places all in very close proximity: Peggy’s Cove, Lunenburg and Mahone Bay and Blue Rocks. On the opposite coast on the north side of the island, we spent some time exploring the Northumberland Shore. 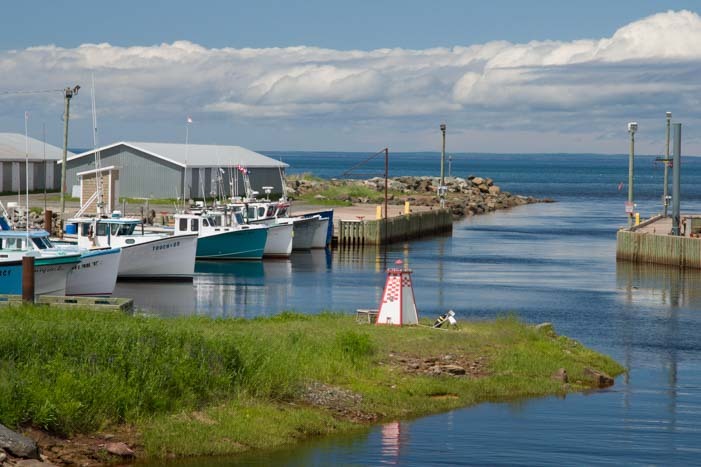 The town of Pictou is a quiet town that is a little off the beaten track. While wandering around the waterfront we were surprised when two different locals come up to us to tell us about the area. One told us about the beacon from a lighthouse that is on display and showed us a photo he had taken years ago when the beacon was still atop the lighthouse. The other handed us some tourist literature. Both expressed hopes that we’d stick around a while. At the heart of the small waterfront there is a replica of an old ship, the Hector. 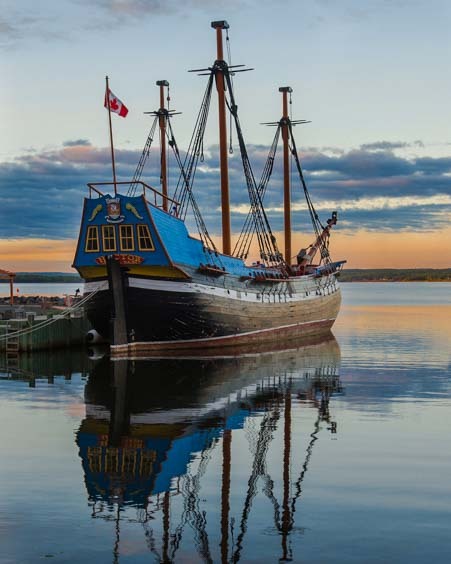 It is a three masted ship that brought the first wave of Scottish highlanders to Nova Scotia in 1773. 189 people were crammed aboard this boat to make the voyage across the Atlantic. The shocker is that it is only 85′ long! Immigrant ship Hector carried 189 Scots to their new home. 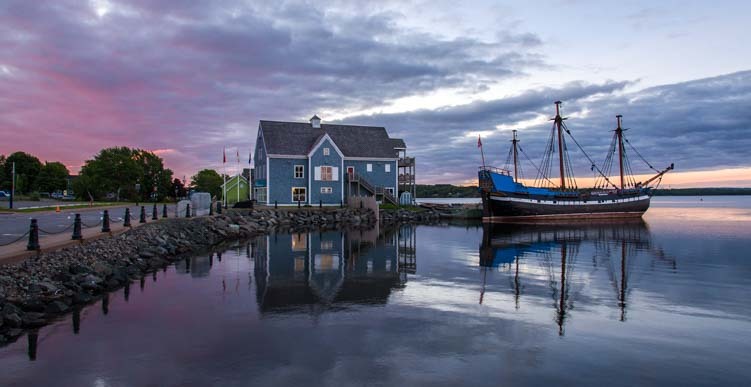 Nova Scotia was settled by the French in the 17th century as part of Acadia, a colony of New France, in the northeastern part of modern day Maine and Canada’s Maritime provinces and parts of eastern Quebec. The Scottish came to Nova Scotia 100 years later, but unlike the French who didn’t continue populating the area with more boatloads of people, the Brits came in ongoing waves, and they soon outnumbered the Acadians by a large margin. In the end, the conflict between France and England over the territory in northeastern North America ended with the British in control and the Acadians being exiled. Some Acadians went to Louisiana, and we now refer to them as Cajuns, while others scattered or steadfastly hung on as best they could in the northeast. 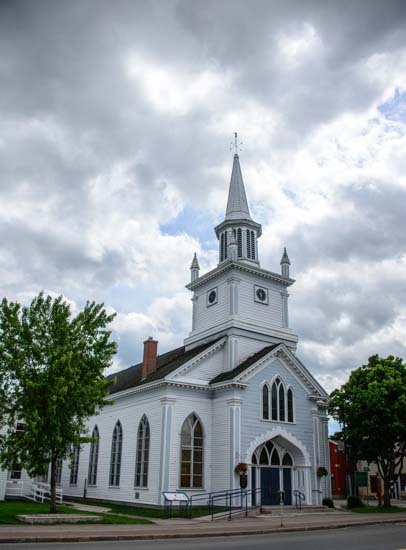 Many towns in Nova Scotia towns identify deeply with their Scottish or French roots, and they celebrate their unique and distinct histories. In Pictou, a lovely path winds its way from town out along the waterfront and we enjoyed a bike ride by the shore. 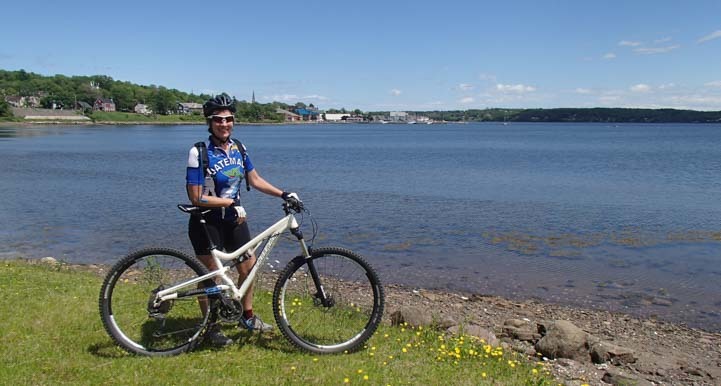 Pictou has a lovely walking/biking trail from downtoan. Heading west from Pictou, the coastal road between Tatamagouch and Caribou Island was another lovely drive. 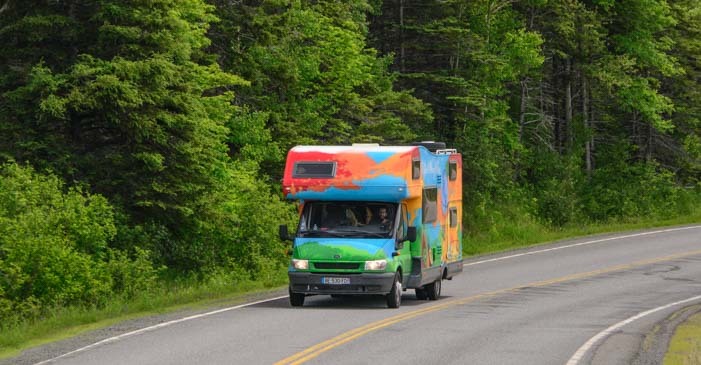 Over the years, we had heard from several sources that Nova Scotia was an awesome place for boondocking, and we really looked forward to finding little spots here and there to tuck in and go exploring. However, I don’t know why it was, but we didn’t have the kind of luck that other people seem to have had, and we found it difficult to find good spots in Nova Scotia. 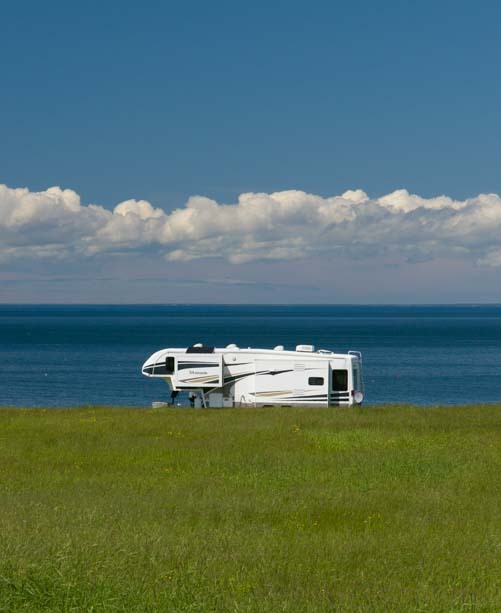 We did see one fifth wheel parked in an ideal spot overlooking the Atlantic near Seafoam, but it appeared to belong to the guy who owned the land! Here and there we found wonderful little harbors with lobster boats or pleasure boats moored inside. The colors were captivating. The Northumberland Shore has lots of farmland, and we saw some lovely spreads as we drove around the area. 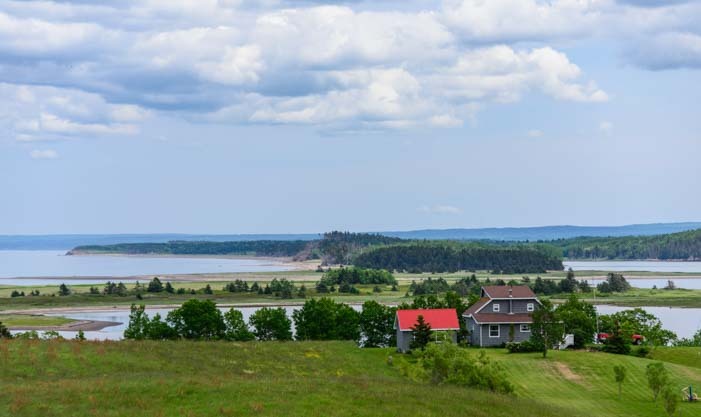 Beautiful farmland in the Northumberland Shore on Nova Scotia’s north coast. Getting out onto some of the more remote roads, the traffic lightened up considerably, and we found ourselves sharing the road with a big old tractor! A tractor sets the pace as we drive on these country roads. Then we saw an RV go by that was all done up in wild colors. 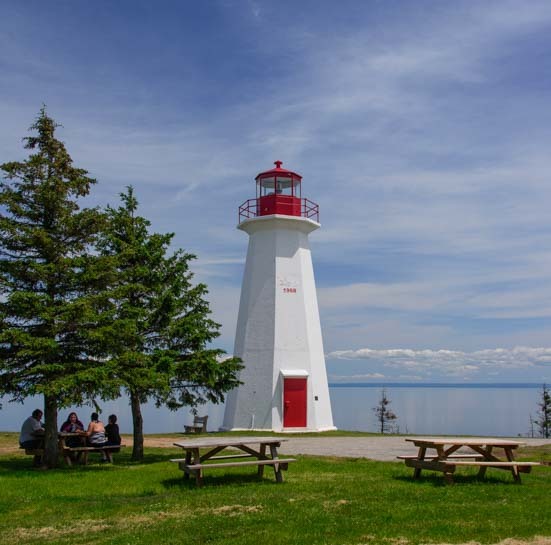 One scenic drive that we enjoyed went from the town of Antigonish out to the lighthouse at Cape George. A little further north was the delightful shoreline of Ballantynes Cove where lush farmland sits on a plateau overlooking the ocean. At the water’s edge, the land falls away in red cliffs. 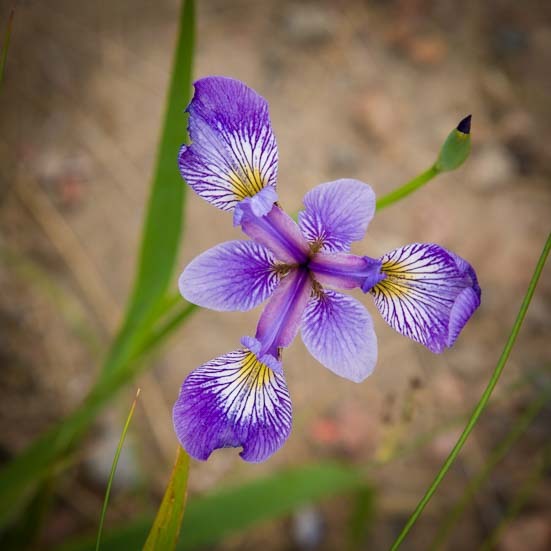 Mark spotted an especially beautiful wildflower in our wanderings. The town of Antigonish had a fantastic fireworks display on Canada Day (July 1st) and we had fun catching the explosive colors on camera. At the northeast end of town we found Antigonish Landing, a little hiking and biking trail that goes along the water for a ways. 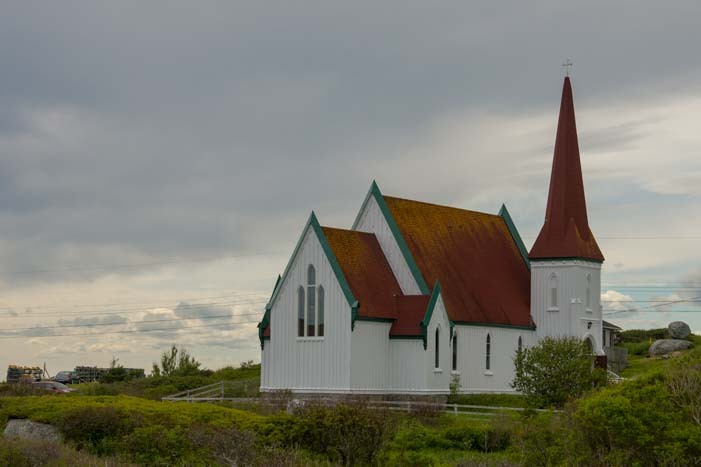 We loved the churches all around Nova Scotia, and we found a beauty in Antigonish. 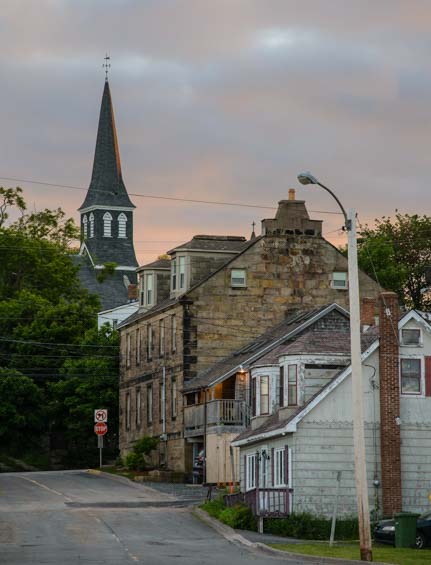 The Northumberland Shore is not as quaint and heavily visited as the South Shore destinations of Lunenburg and Peggy’s Cove, but the towns are lovely and less touristy. 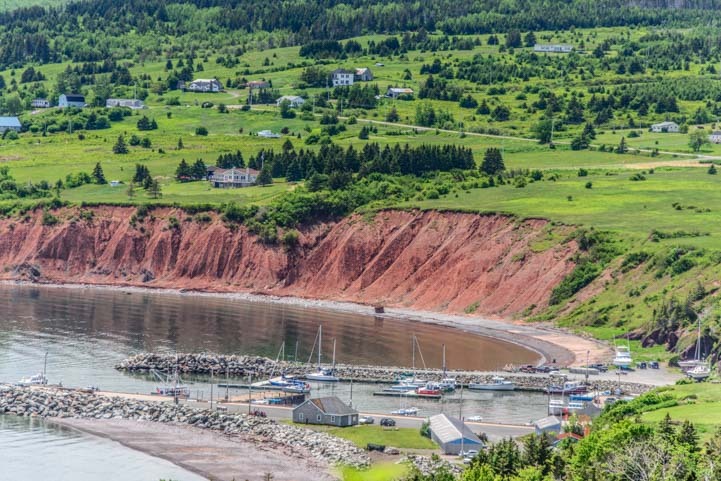 As a note to RVers headed to Nova Scotia, perhaps the thing that surprised us most was that it takes a lot of driving to get from place to place. Studying the map ahead of time and planning where to drive and leave the RV and where to drive the tow vehicle or toad on daytrips is very worthwhile. We had both thought of Nova Scotia as a fairly compact island, when it is actually very large and expansive. We found ourselves driving 100 miles a day to get to the places we wanted to visit, and even then, we discovered we were barely scratching the surface! Gorgeous photos, as always. We’ve been thinking about a trip to Nova Scotia for several years, and every time I waver (thinking it’s too far to go), then I see another post from you and am enticed all over again. 🙂 We’re planning to spend July and August in Nova Scotia — from your experience, does that seem like enough time? That is plenty of time, and you could probably make it to Newfoundland (by ferry) as well. 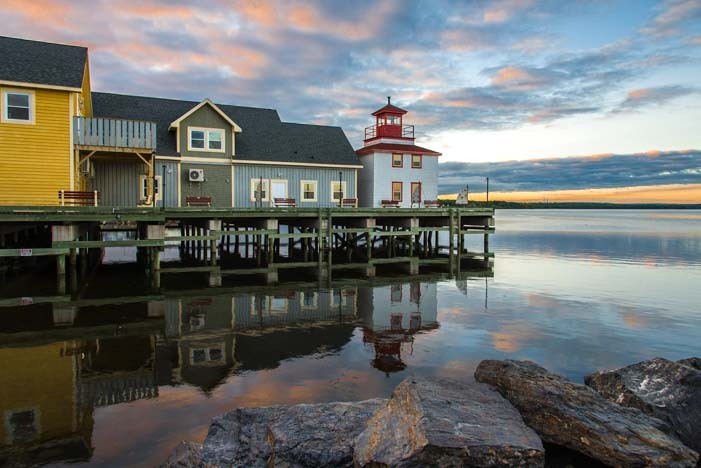 If you haven’t spent much time in northern Maine, though, allocate plenty of time for that. We were utterly smitten by Maine north and east of Acadia National Park — and this is coming from someone who has spent a lot of time in Maine in the past and who felt she kinda “knew” Maine. Nova Scotia has some beautiful areas, but we found it difficult to travel there with our big fiver. We’re planning to explore Maine in September, hopefully after the crowds have thinned. We could likely be there the entire month! 😉 As far as Nova Scotia, do you think a smaller trailer (ours is 27′) would also be challenging on the roads? I appreciate so much your advice and experience. I think any trailer over about 20′ would be a challenge (for us) on the scenic coastal roads, simply because of the poor conditions of the roads, the traffic and the speed the drivers like to go. But everyone has a different threshold of what they consider easy versus hard driving. If you take the highways to the RV parks where you want to stay, and then take your tow vehicle to see the sights on the smaller roads, you’ll be fine! A friend recently told me about your blog, and I read every single post. You’re living the life I wish I could live! However, we do well enough traveling 4-5 months of the year in our fifth wheel. 🙂 Wondering your thoughts on our timing for our upcoming visit to Nova Scotia. 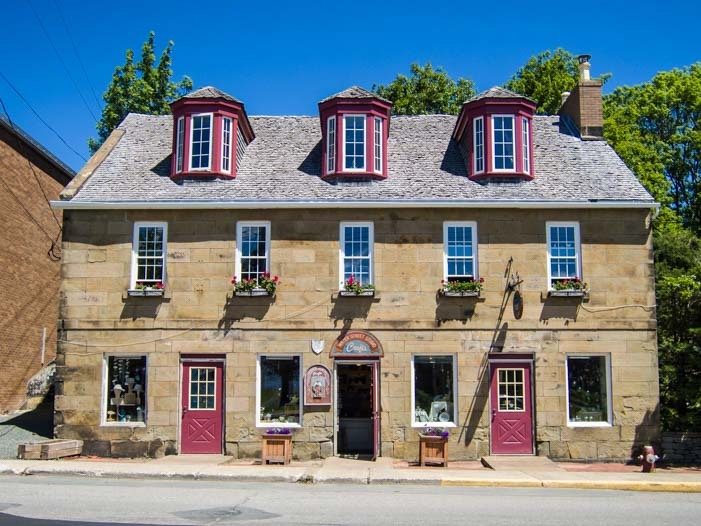 We plan a few days in the Annapolis Royal area, 8 days in the Mahone Bay area, 8 days in the Cape Breton area. We’ll be in Cape Breton during Celtic Colors in the fall. We’ll put the 5th wheel in a campground and only travel the coastal roads with our truck. Do you think this is enough time for us to see things in depth? What I mean by that is that I’m a photographer and perhaps like to see things a little more in depth than the average person. 🙂 We don’t want to feel rushed, yet we also don’t want to allow too much time either. After reading your post about the Northumberland Shore, I think we now want to include that area as well. So we’re wondering how we can cut down on the other areas to allow some time there. Any thoughts or recommendations would be greatly appreciated. And keep up the great work on your blog!!! I love it!! I’m happy your friend pointed you in our direction, Christal, and I’m impressed you read all 700+ articles on this website. That’s quite an undertaking!! 😉 Even if you read just a few of the articles, I sure appreciate it and hope they have been helpful to you. Three to five weeks in Nova Scotia is a good amount of time to get a feeling for it. We spent 3 weeks there in June/July and were satisfied with our trip. All of our Nova Scotia blog posts are at this link. Have a blast and take lots of pics!! Well, actually, I meant I had read every single post since I subscribed to your blog. Plus random others I’ve searched for. Not all 700….yikes! Are there really than many? 🙂 We are home now from the Maritimes and had a wonderful time. Thanks for continuing your blog. I refer to it often when we have a trip planned. Keep up the great work! I’m so glad you had fun in the Maritimes, Christal. It’s such an interesting area. And thanks for reading all our posts since you subscribed. We sure appreciate that! There is definitely a ton of info here for all kinds of people, from North American RV trip planners to future full-time RVers to folks planning a sailing cruise or extended travel in Mexico, to people curious about Thailand, Cambodia, or the southern Caribbean or even Paris, to people wondering about the nitty gritty of solar power and other major RV or sailboat systems upgrades. If the info here is helpful to you and the spirit ever moves you, our work is funded by loyal readers like you via the “Donate” button at the bottom of each page or by purchases made after visiting Amazon using any of our links. Happy travels and have fun planning your next trip! !